Comprehensive review of Sienna X Dark Glowing Self Tan. 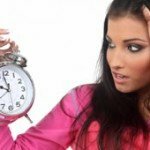 See what real experts and actual users have to say about this self tanning product. I ended up really like Sienna X Dark Glowing Self Tan. 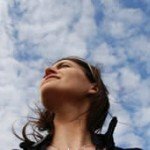 This company is based in the UK, but I know there are a few places you can find this product online that ship the the USA. I was a little intimidated by the super dark guide in this one, but I used a tanning mitt to apply it and it wasn’t so bad. You have to be very careful when applying it, because it could stain if it gets anywhere it’s not supposed to be. After you wash off the guide(after leaving the product on for 8 hours) your left with a really nice looking tan. My tan was a medium to dark shade and it looked so natural and smooth. I was really happy with how my tan looked, I looked sun kissed! My tan lasted about 4 days before it started to fade, and unfortunately it became very streaky as it faded. That’s the one thing I really didn’t like about this one. On the bottle it says it’s an “anti-cellulite” formulation, and when I put it on I did feel like it helped mask the appearance of my cellulite. Overall, this is a good self tanner and I’d recommend it for those looking for a medium tan. Sienna X Dark Glowing Self Tan is a very dark, thin lotion. It feels very smooth and velvety. It has a super dark guide, so be careful. I’m usually pretty scared when it comes to applying self tanning lotions with really dark guides. They tend to be messy and get all over the place. This one wasn’t too bad, but it still has the potential to get messy. I used a tanning mitt, which I highly recommend doing when applying this self tanner. The product blends nicely into your skin, and as long as your careful it doesn’t get all over the place. I was pretty happy with the time this one took to dry. From start to finish, it dried in about 20-25 minutes. That’s pretty average. This lotion was pretty thin, and I think that helped it dry in decent time. While you’re waiting for it to dry make sure you don’t sit on anything because the dark guide will stain. Sienna X Dark Glowing Self Tan smells SO good! It smells very girly and sweet, almost like a Victoria Secret product. It smells a bit tropical and fruity. I can’t put my finger on the exact scent, but trust me it smells delicious. I wish the smell lasted longer, but when I woke up I could only smell a faint hint of the sweet smell. I couldn’t smell any DHA though, which is always a plus. I really liked how my tan looked after I showered off the guide. The guide obviously made me look really dark after I applied it, but once I washed it off I had a medium to dark tan. My tan was very smooth and natural, I loved how it looked. I would’ve liked my tan to be a shade or two darker, but as it was it looks really good. If you’re looking for a medium-dark tan you’ll really like the color Sienna X Dark Glowing Tan gives you. Unfortunately, it became pretty splotchy as it faded. That’s the one thing I really didn’t like about this product. 4 days is pretty average for a tan to last before fading. Yes, if men are okay with dark guides than I think they’ll like this one. It smells good and produces a nice looking, natural tan. But it does fade a little splotchy, so you’ll need to exfoliate to get it off! 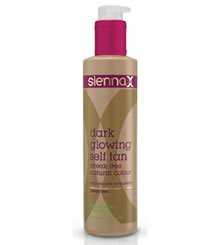 Sienna X Dark Glowing Self Tan sells for $37.36 for a 6.8 oz bottle. That works out to $5.49 an ounce, which is a tad pricier than average, but not bad at all (especially considering you get a good product). To buy Sienna X Dark Glowing Self Tan, Click Here. Look and Feel This is a dark brown lotion that is pretty thin. Application It can be messy so make sure to use a tanning mitt! Drying Time It dried in 20-25 minutes, which is pretty average. Smell (Before) Smells really good, very sweet and girly. Smell (After) I could barely smell the product when I woke up, but no DHA! Color Produced I got a medium-dark smooth tan. How Long It Lasts It faded after about 4 days, but it became pretty splotchy. OK For Men? Yes, as long as they’re ok with the dark guide. Price This one is a little above average on $5.49 per ounce.